This gallery contains over 150 images of Senator Joseph R. McCarthy of Wisconsin. McCarthy served as a Republican senator from 1947 until his death in 1957. Images include portraits of McCarthy, documentation of campaign events, a few family photographs and materials related to campaigns and anti-communist rhetoric. McCarthy Match Book Cover, 1951 ca. Wisconsin Senator Joseph McCarthy held the nation in his grasp with his anti-Communist rhetoric for four years in the early 1950s. To his enemies, McCarthy was evil incarnate, but to his supporters, he was an ardent champion of freedom. Elected to the U.S. Senate in 1946, Joseph McCarthy created a sensation in 1950 when he announced during a speech in Wheeling, West Virginia, that communist members of the State Department were influencing American foreign policy. At the time, communist expansion in Eastern Europe and Korea fueled Americans' anxiety that their way of life was under attack. Proclaimed just as Americans were preparing to fight in Korea, McCarthy capitalized on people's fears of encroaching communism to launch a public campaign aimed at eliminating the supposed communist infiltration of government. Re-elected in 1952, McCarthy, as chair of a Senate Permanent Investigations Subcommittee, took it upon himself to expose communists and their sympathizers throughout all of American cultural and political life. The Subcommittee interrogated more than 500 people under his leadership, often refusing to reveal their sources of information under the veil of national security. 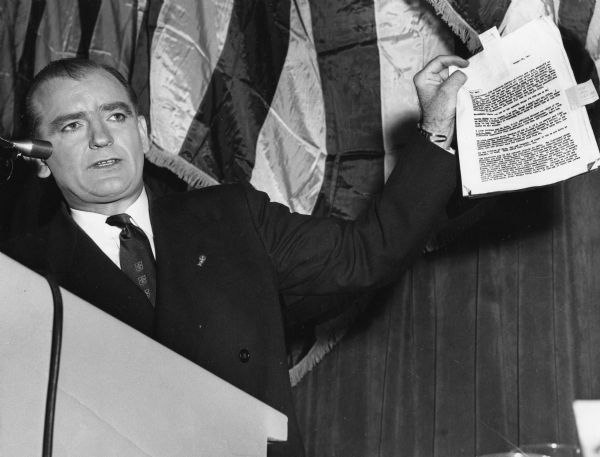 In 1953, however, McCarthy took it too far when he accused the Army of harboring communists. The televised Army-McCarthy hearings that ensued exposed many Americans to McCarthy's bullying tactics and ruined his public reputation. The next year, the Senate officially censured McCarthy for "conduct unbecoming a senator." His ostracism from his party, coupled with chronic alcoholism, led to his death three years later.